"This is my gluten-free knock-off of Classic Bisquick® Baking Mix. This replaces cup-for-cup any recipe calling for Classic Bisquick®, not recipes calling for the gluten-free version of Bisquick®. Classic Bisquick® has fats in the mix whereas, the gluten-free version does not. My recipe contains oil and needs to be refrigerated after being mixed. It will last up to one week in an airtight container in the fridge. The addition of gluten-free cereal mimics the enriched flour aiding in the baking process as well as adding vitamins." Grind the powdered milk until fine. 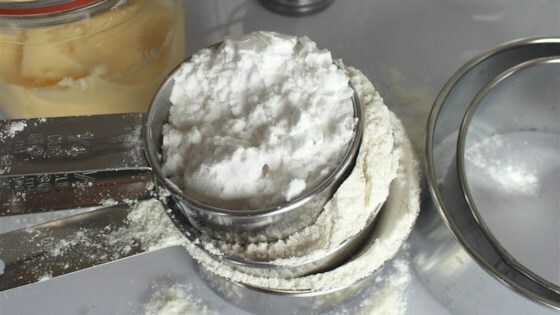 Combine rice flour, potato starch, tapioca flour, powdered milk, rice cereal, powdered egg whites, sugar, baking powder, cream of tatar, and ascorbic acid together in a bowl; mix with an electric mixer. Add butter and mix until well combined. Transfer to an airtight container; store in the refrigerator. A delicious and healthy hot cereal with 8 gluten-free whole grains and seeds. Either brown or white rice flour can be used. Lard, shortening, or coconut oil can be substituted for the butter, if desired. I use this often for pancakes and biscuits. Today, I made this with 1/2 cup powdered buttermilk for some pancakes and they were delicious.